The latest monthly international enrolment and commencement report shows a 10% increase in full-fee paying international students on May last year. As at year-to-date (YTD) May 2014, there were 404,909 enrolments by full-fee paying international students in Australia on a student visa. This represents a 10.1% increase on YTD May 2013 and compares with the average YTD May growth rate for enrolments of 4.6% per year over the preceding ten years. There were 170,269 commencements in YTD May 2014, representing an 18.4% increase over the same period in 2013. This compares with the average YTD May growth rate for commencements of 4.6% per year over the preceding ten years. The largest volume of enrolments and volume of commencements at YTD May 2014 were in higher education (49.3% and 34.7% respectively). Enrolments and commencements in the sector increased by 6.4% and 13.6% respectively on 2013 figures for the same period. China and India accounted for 38.4% and 9.0% respectively of enrolments by students in higher education. Post-graduate research commencements in higher education increased by 8.1% andother post-graduate commencements grew by 19.9%. Bachelor degree level commencements also increased by 5.5% over the same period. Vocational Education and Training (VET) accounted for 23.6% of total enrolments and 27.0% of total commencements. Enrolments and commencements in VET increased by 5.9% and 18.0% respectively on YTD May 2013. India had the largest share of total enrolments (18.6%) and of total commencements (16.2%). China accounted for the next largest share of enrolments with 9.9%, followed by the Republic of Korea (7.8%) and Thailand (7.0%). English Language Intensive Courses for Overseas Students (ELICOS) accounted for 18.7% of total enrolments and 26.9% of total commencements. Enrolments and commencements in ELICOS grew by 26.7% and 25.6% respectively on 2013 figures for the same period. 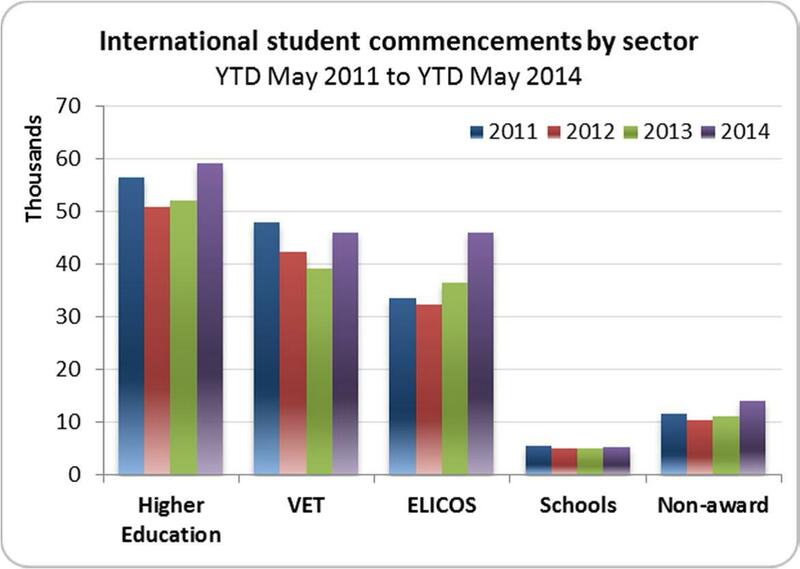 China accounted for the largest share of enrolments (22.6%) and of commencements (20.4%) in ELICOS. Brazil was the second largest nationality for enrolments (9.3%) and commencements (7.9%), followed by Thailand (8.9% of enrolments and 9.4% of commencements).